Featured in Vogue USA, Vogue Arabia, Huffington Post, Velvet Magazine, and ( so ) many more publications, Sofia El Arabi has undoubtedly made a name for herself in the fashion world. With a personal style that can only be described as, a queen of the desert meets Emmanuelle Alt minimalism. Sofia has been described by many as the fashion It-Girl of Morocco, and a North African style inspiration. However, it is not only El Arabai’s impeccable taste that made the fashion industry notice her, but also her successful clothing brand; Bakchic. Knowing that we cannot do due justice in talking about Sofia, Bakchic, and all the story and genius behind this North African phenomenon. We instead opted for interviewing her, and picking her mind about her journey, her style, her brand, fashion in Africa, her stunning Instagram account, and of course asked for some fashion tips. So, here it is! Your brand Bakchic’s Instagram bio reads; “WEARING YOUR CULTURE PROUDLY”. Would that sum you up as the “style inspiration” that you are, and your journey with fashion so far, or would you describe it in other words? I think I may have found my way to Bakchic , while on a journey seeking my own self. What I mean here, is that we are all born in a predetermined globalized culture where individuality has been drowned in a very complex crossed-cultural recipe. I just wanted to figure out what the real ingredients are that I’m made of. I think Bakchic answered a real need of dress identity in the Arab world. It is supposed to make you feel that you belong to a world, a history, a culture, it means more than mere clothing pieces. And that not only to my Arab or African customers, but also the international ones who are interested in an Eastern culture. The main goal of Bakchic is to make all the traditional clothing treasures of Morocco, and the Arab world in general, which once were only used for special events and occasions, be wearable on a daily, casual basis. That of course while preserving their delicacy, which I think can be achieved by going beyond the over-ornamented aesthetic of the kaftan that often comes out. And rather focus on what it really represents; an ancestral know-how. Where does the word “Bakchic” come from? I initially wanted to call my Blog “Fashion Bakchich (meaning Arabic: tip)”, but the last “H” accidentally disappeared when I wanted to publish the banner. So I took that as a sign, and decided to go ahead with this beautiful name of Bakchic, which then logically ended up being the name of my brand. Who is the Bakchic girl? She is feminine, cool, and androgynous. For me the most beautiful women are the ones who wear the clothes, and not the opposite. I, the Bakchic girl, like the idea of wearing a white tee shirt, vintage Levis shorts, and a long kaftan with big earrings and a red lipstick. What does the perfect Moroccan inspired outfit look like for you? A pair of big vintage Moroccan gold earrings, with a long printed dress, and greek sandals. It’s my fantasy look. You have been sharing your style and aesthetic for many years now, however only lately have you been getting attention on an international level, how does it feel like? How much do your African roots inspire, not only your brand but your style as well? First, my roots enabled me to understand that the African, Arab, and even the Middle Eastern world are all related by a very rich and diverse ( and common ) culture. Whose finesse and beauty reflect a strong history, past and present, of emotional, intellectual and esthetic intelligences that go beyond the medias’ stereotypes. I believe my African roots and mostly style are a peaceful and effective way to communicate messages and ideas, that make it impossible for other media means to compete with. Because the latter means lack the innocence and honesty of the clothes. On another note, I include all the traditional artifacts and clothes from Africa in my moodboard, as part of my everyday work and inspiration. 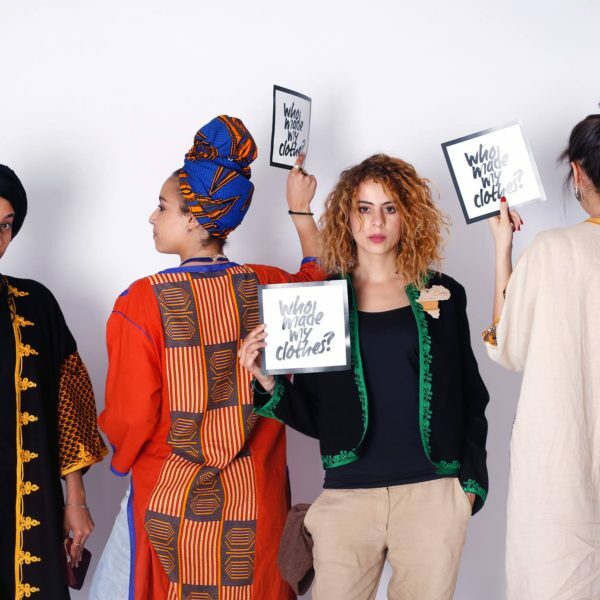 What are some North African fashion brands that you think are not to be missed? Many world famous brands, such as Kate Spade and many more have taken inspiration from Morocco for their designs (kaftans, babouches..) for years. What is the one Moroccan trend you would want to see inspire the west in the future, or one that you see hasn’t been presented the right way? What would you like people to know about the Moroccan aesthetic in particular, and the African one in general? When you say Moroccan aesthetic, people think about zellige tiles, colors, babouches, camels. And in a way it is true. Sometimes I even find myself as a tourist in my own country, because it is, and looks like a movie. However, I would rather have people also think of in as another aesthetic, as a more minimalistic fashion. Your Instagram account is a visual treat. How much effort and thought is put in every photo posted? I post one picture per day, and share 2 to 3 stories maximum. I spend 1 hour per day on Instagram and never more. My philosophy is that we live once, and I have other things I would like to see in reality, rather than through a device. For the Moroccan aesthetic fans out there, what are the must-have pieces they should own? One embroidered top to wear to a fancy party. All the vintage jewelry you can find during your stay in Morocco. Moroccan beauty products from Maison D’Asa. How would you describe African fashion, in your own words? It’s growing and it looks good.